We've received the following missive from our trusty team captain, Bruce. He wanted you all to know about the 7 Sisters race, a mild-mannered 12-miler with a wicked 3700' total elevation, and also to let you know what he thought about his swank new GoLite trail-running shoes. In the midst of my usual fare of long trail running events, it’s nice to occasionally enter a sprint-distance run. The logistics are simple, equipment is minimal and those nagging “excessive usage” injuries that affect joints, feet, muscles, tendons, etc. never have a chance to emerge. Unlike endurance running, you can allow yourself to run at irresponsible speeds and push yourself to unsustainable limits. However, the painful side of that equation is that you have an obligation to do so in order to be competitive. The most vivid example of this speed/pain equation that I've experienced recently has been in the form of the stair-climbs up the Empire State Building and the Sears Tower. But I'll keep the focus on the outdoors with a recent trail run. Upon the recommendation of an unnamed Team EMS competitor, I entered the Seven Sisters Trail Race held in central Massachusetts on the 6th of May. This race went out-and-back along a 6-mile section of trail that was as challenging as any that I've seen. The elevation gain was 3700' in total and the route could be described as primarily narrow, single-track trail with sharp elevation changes and plenty of rocks, roots and other tripping hazards. The conditions were dry, but traction was critical on steep (and fast) descents in loose dirt, running on off-camber rock surfaces and numerous steps with relatively high force and small contact patches. For most readers of this blog, this equates to an enormous amount of fun as long as you don't fall – which I didn't. In the end, a review of the results yields 257 competitors with a first-place finish of 1:42. My time was 2:19 as the 28th person to cross the finish line. I used this event as a test for the performance of the GoLite Sun Dragon shoes. 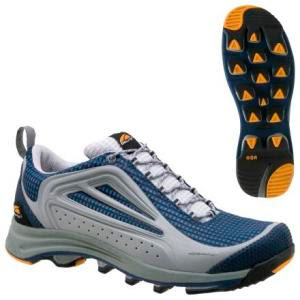 In brief, they were the same weight or lighter than my usual trail runners, the traction of the exaggerated lugs was excellent on loose dirt and quite good on rocks and they were generally comfortable on the uneven terrain. On the downside, speedlaces would be more desirable than the traditional laces. My only real foot problem was self-induced: I often choose adventure racing shoes that are a full size larger than usual to allow for foot swelling and other evils on a long course. Under these fast and forceful conditions, this translated to excessive movement of the unnecessarily large shoes on my feet and a couple minor blisters. Overall, an interesting product from GoLite.